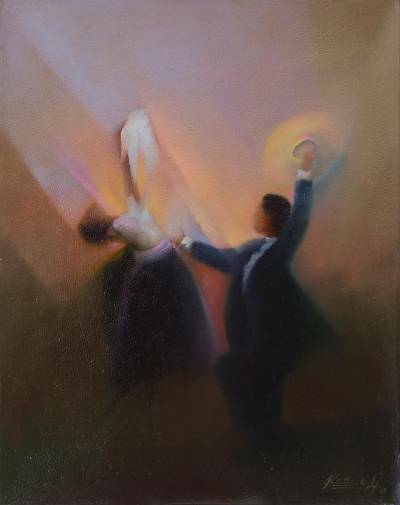 Signed Expressionist Painting of a Dancing Pair from Peru, "Final Gesture"
Working in an expressionist style, Peruvian artist Teodoro Reque Liza uses oils to paint this exciting image of a dancing couple. A blurred technique captures the movement of the man's hat and of the woman's handkerchief as they perform their final gesture. This dance is known as la marinera, popular in the north of Peru and characterized by the use of elaborate props. Titled Gesto final in Spanish.